During the first week of every college semester, or what I like to call “syllabus week,” we get the same old song and dance about how cellphones need to be put away or else grades will suffer. As a senior at New Mexico State University, I say enough is enough. The professors’ rants about how cellphones distract the user and other students from learning are not entirely accurate. Never in my collegiate career have other students using their phones made it impossible for me to focus. While using a cellphone in class can be a bit distracting for the person using it, trying to hide phone use during class is an even bigger distraction. It is faster for us to send texts, Snapchats, or whatever type of message it may be when we don’t have to avoid getting caught. Trying to pretend we are listening to the professor while we sneakily keep contact with the outside world is not only exhausting, but unnecessary. A lot of time could be saved and spent focusing on the class if we could openly text and what not. 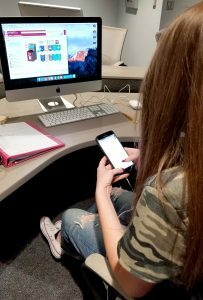 According to a 2016 study published in “Journal of Media Education,” 97 percent of college students use their phones for non-educational purposes during class. The professors might as well abandon their futile efforts to ban cellphones from the classroom because it is not working. Of course, many professors use the same excuse to justify their dictatorial behavior: Cellphone use in class will negatively affect our grades. This statement is not true. According to Scott Campbell, an associate professor of communication studies at the University of Michigan, “The research is inconclusive about whether using devices during lectures will translate to lower grades. It depends on many factors like class size or what is being taught.” Campbell has seen studies that show lower grades as the result of digital distraction and other studies where there is no significant effect on grades. Now that we have cleared up that misconception, we can focus on the sad realization that when we leave high school and enter college, we are still not treated like adults. Sure, there’s no dress code or bedtime anymore, but we still can’t use our phones when we want to. I have heard over and over again that no late assignments will be accepted because in the real world there are deadlines and we have to start learning how to be responsible adults. Well, I’m pretty sure in the real world these so called “responsible adults” can use their phones without being reprimanded. If professors want us to act grown up and be successfully functioning adults in the outside world, then they shouldn’t treat us like children. If students are using their phones and that is affecting their academic performances, then that is their own fault. They need to learn to multitask better or get their priorities straight. Banning phone usage won’t help those students. They will use their phones anyway. If they fail the class, they will just have to pay to retake the course again, but I have never met anyone who has failed a class because of phone usage. I want to clarify that I love all my professors. They are great teachers with positive attitudes. I have no issues with them, just with their cellphone policies. Nevertheless, I will make one last point. I pay a lot of money in tuition every year, and every year it seems like it increases. According to a 2017 NMSU News Center article, a student paying in-state tuition at the main campus taking 15 credit hours will pay $197 more per semester in 2018 for a total estimated cost of over $20,000. That is an insane amount of money that I willingly pay to be educated by professors at the university. I pay to be in class learning about whatever the subject is. So, if I’m paying to be there, I will use my phone as I please.